Blackpool manager Neil McDonald has leapt to the defence of Karl Oyston, dismissing claims he isn’t being backed by his chairman as “rubbish”. It comes after another Bloomfield Road horror show against Walsall on Saturday, a result which leaves the club at the bottom of the League One table. McDonald has spoken repeatedly of his need to bring in more players but the manager concedes that he has hit a brick wall in recent weeks, with two more players turning down a move to Blackpool last week. Many point the finger of blame at the much-criticised chairman but McDonald insists that is unfair. McDonald has stated, though, that the “situation” and “off the field issues” surrounding the club have added to his recent recruitment problems. 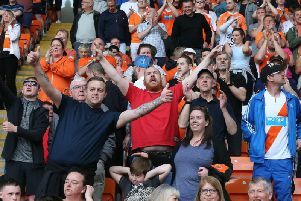 Blackpool haven’t won since January and many fans have turned their back on the club, with Saturday’s match played out in front of another sparse crowd. But McDonald certainly isn’t criticising his boss. He added: “I’ve had plenty of support from the chairman. We’ve brought 12 players in. “We’ve just hit the buffers a little bit at the minute. The transfer window closes at 6pm tomorrow.